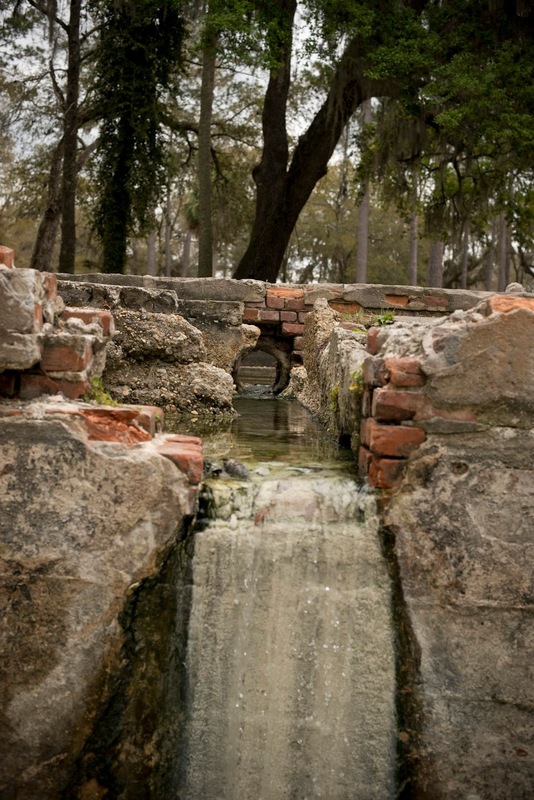 Five years after "Finding the Fountain of Youth" was published, I am fortunate enough to still have speaking events, most recently at the Matheson History Museum in Gainesville. Since this talk coincided with the start of Spring Break, it seemed like an excellent opportunity for some spring hunting. 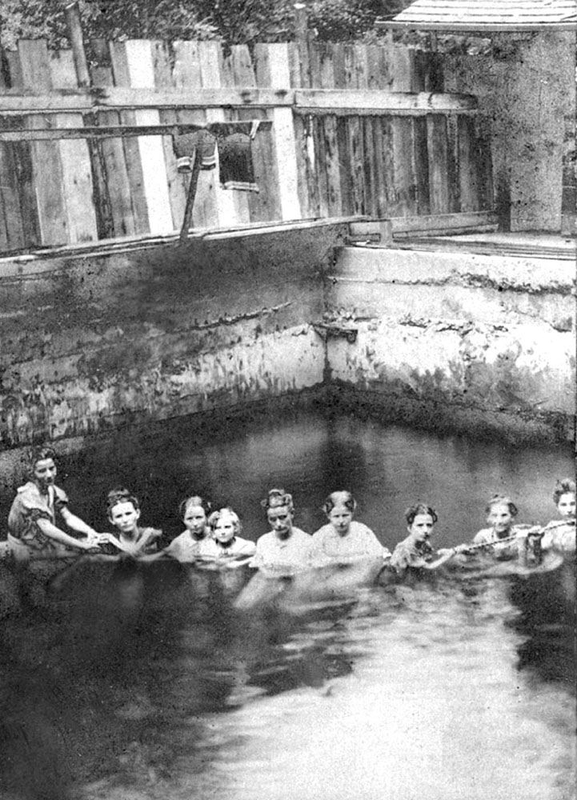 Lately I'm not hunting for beautiful cerulean swimming holes, but rather the vestiges of what I call "Florida's Golden Age of Bathing." That refers to the era after the Civil War when invalids and tourists poured into the state looking for restoration and relaxation in dozens of spring-side spas. 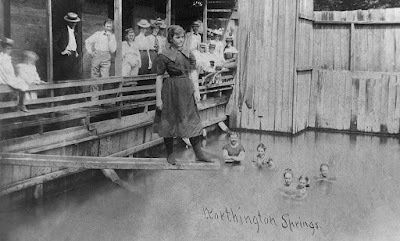 The first stop on my tour of forgotten springs was Worthington Springs, about a half hour north of Gainesville. 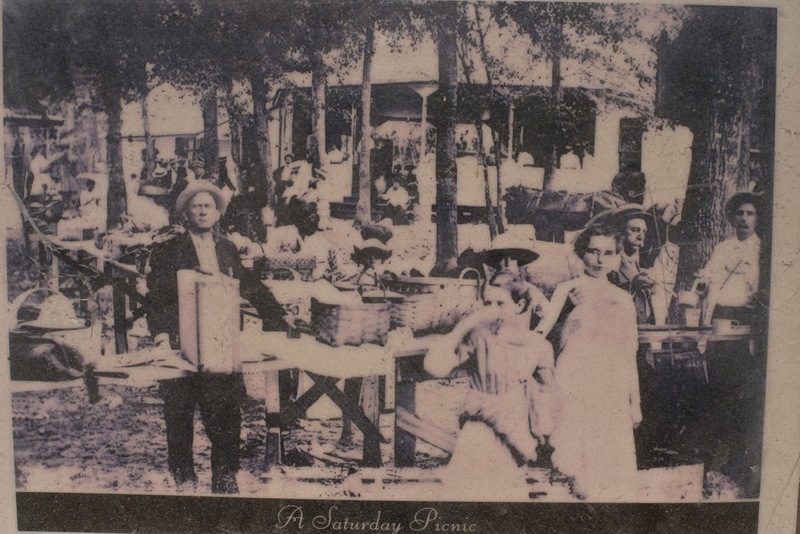 I knew from Jane Keeler's excellent post on the Desolation Florida blog that there was not much to see from the Union County spring's glory days as a destination for tourists, picnickers, and the infirm. Sadly, Chastain-Seay Park, where the Worthington Springs Hotel and the spring-fed bathing pool once stood, was closed due to high waters and the only evidence of the site's history was photographs posted outside the park's boundaries. "The Spring is magnificent and strongly impregnated with sulphur, affords ample bathing facilities and under the able management of Ira Lamb is kept in a first class manner. There is no reason why any one should go elsewhere for an outing when all the requirements are here. No mosquitoes, fine shade right in the midst of where melons, vegetables, chickens, fresh milk and all else to make (l)ife pleasant are found in abundance." 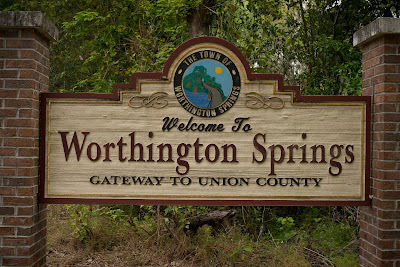 After making a few photographs of the signs outside the park, my wife and I headed to Taylor County, home of Hampton Springs. 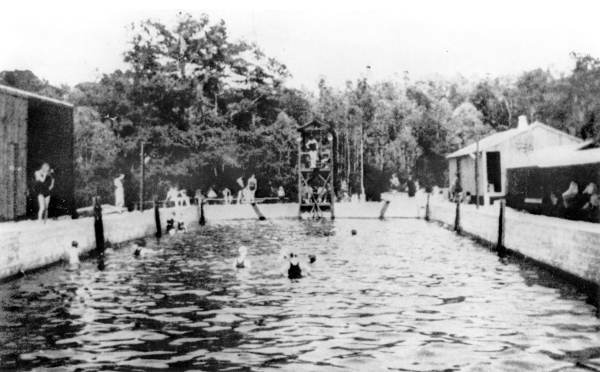 The site of a former resort hotel and spa is now a county park, and it has recently received much attention after the County decided to fill in the spring pool. The County Commission quickly reversed their decision after residents protested the loss of a favorite swimming hole. I talked to the County Administrator who was caught off guard by the vocal reaction, but seemed to see an opportunity in the outpouring of energy from advocates of the spring. This was my second visit to the spring – my first stop was after a talk in Tallahassee on a cold day in 2014. There was no one in the park that day as I poked around as a "polar vortex" threatened the state capital with potential snow flurries and the park was slightly erie and very quiet. 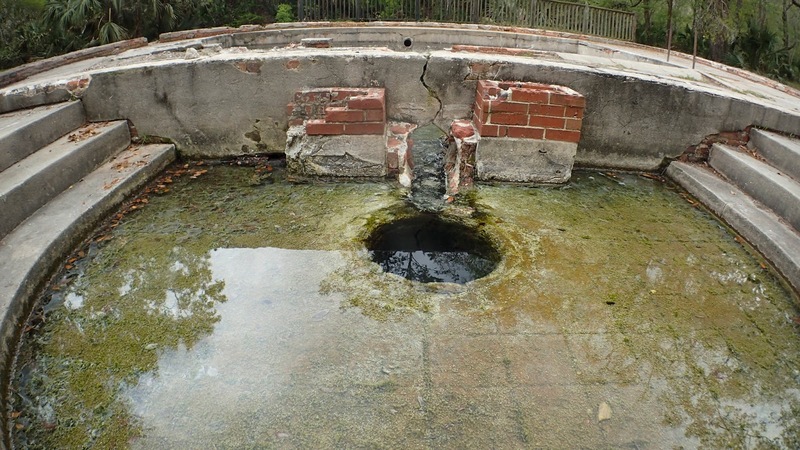 I could see evidence of vandalism then, and the problem has persisted, contributing to the county's initial decision to fill in the spring pool, although the main reason was to minimize liability. 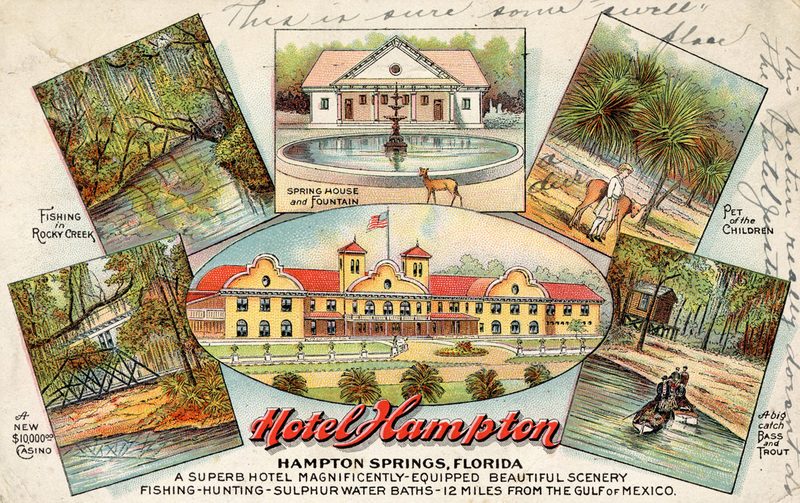 Page from a 1920s promotion booklet from the State Archives of Florida. 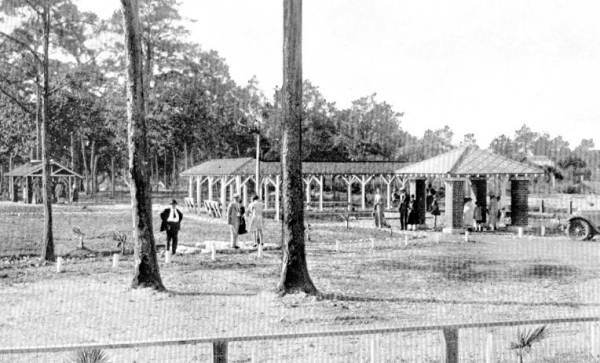 Note the semi-circular area in the photo on the right. 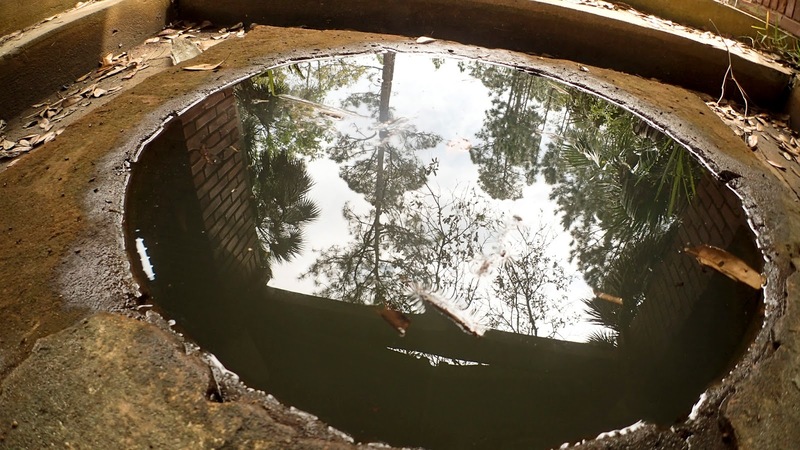 This appears to be the semi-circular area pictured above. 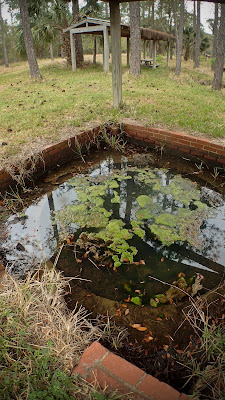 This shallow pool is between the semi-circular area and the deeper pool. 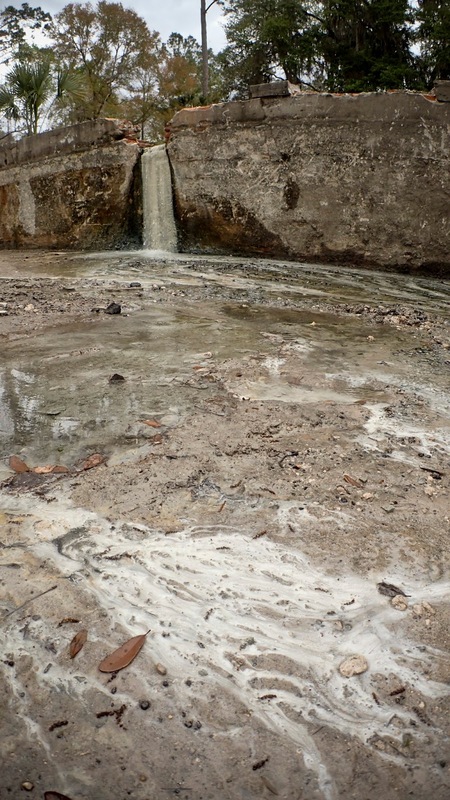 What appeared to be the indication of high mineral content in the water of the spring pool. Water flowing into the recently restored spring pool. On this visit the park was again quiet and I could see evidence of where heavy machinery had removed the concrete debris and gravel used to fill the spring. 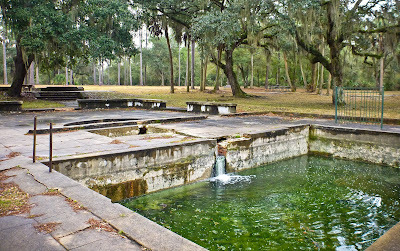 The main pool was full of algae-laced spring water on my first visit, but it was mostly dry this time, allowing me the opportunity to descend the stairs and survey the pool. 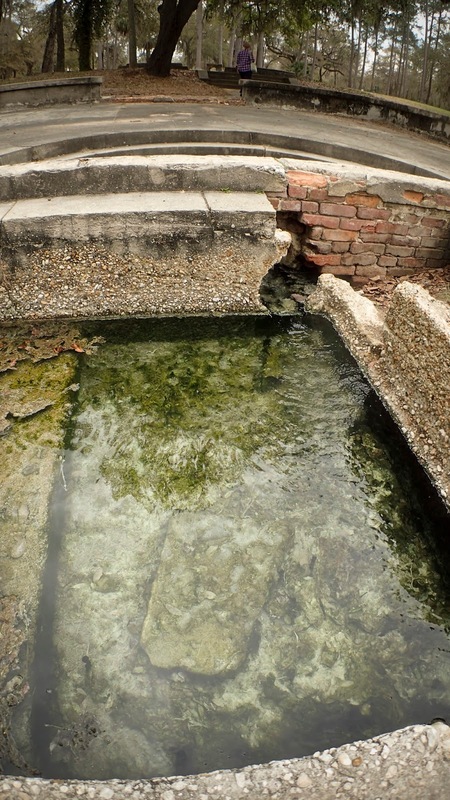 The smell of sulphur permeated the air and there was evidence of minerals deposits from the flowing spring water, which made a miniature waterfall as it flowed down the side of the pool. 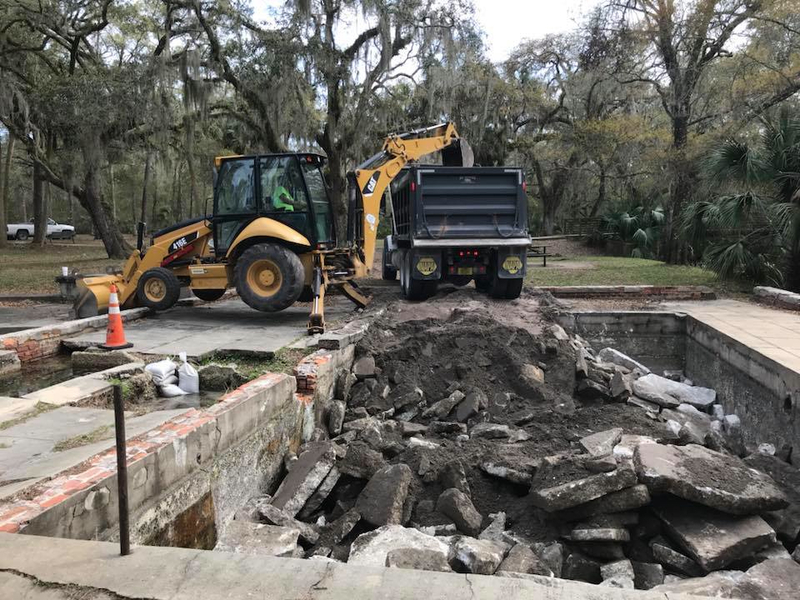 Taylor County cobbled together a series of grants in the early 2000s so that this historic site could be surveyed and partially restored. 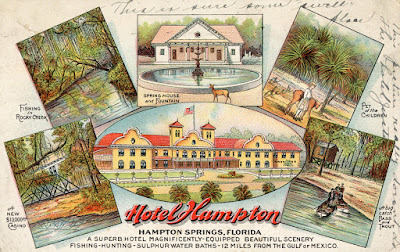 Their foresight has created an opportunity for future generations to learn about an era when visitors arrived via train to take the waters, hunt, fish, golf, and participate in other leisure activities, all while staying in a luxurious hotel. 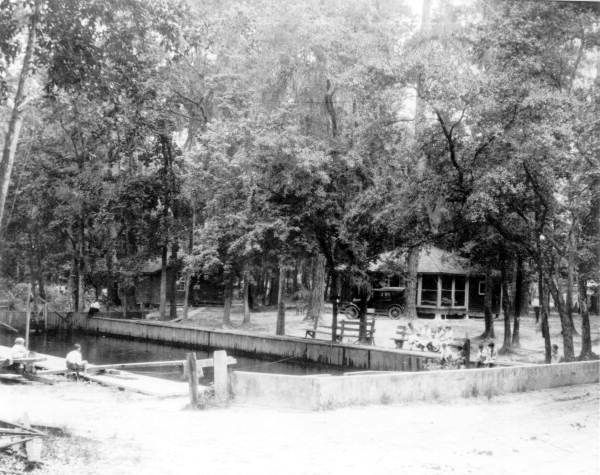 Beyond maintaining a swimming hole for locals, preserving the remnants of this site create a glimpse into a time when "taking the waters" at Florida springs provided the foundation for today's tourist economy. 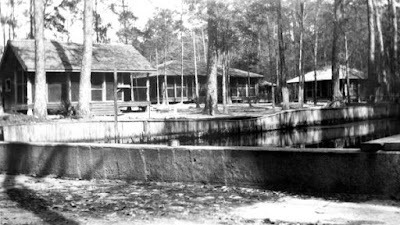 Traveling west on U.S. 98 into the state's Big Bend region, our next stop was Newport Springs, in the tiny unincorporated village of Newport, Florida. 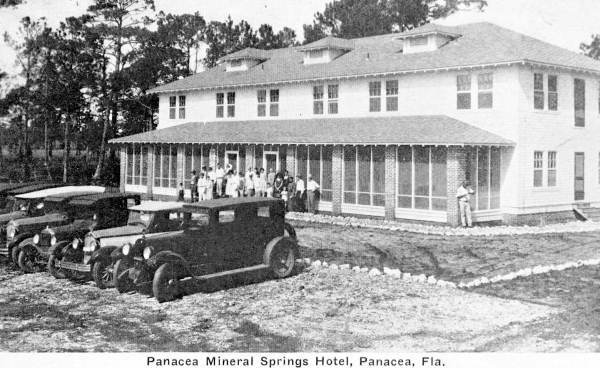 According to 1998 article in the Tallahassee Democrat, this out-of-the-way location boasted a flourishing hotel as early as 1850, and guests arrived by train and mule-drawn wagons. 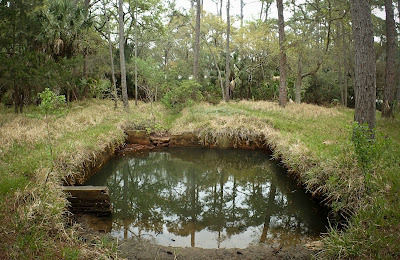 Today the spring is still located just off the unpaved Plank Road, but is surrounded with a menacing fence marked with no trespassing signs. It was a bit disappointing that we couldn't get closer to the water, but it is good to know the watering hole still exists, unlike the pool at Worthington Springs. Text near the bottom of the sign reads “A Florida Learn and Serve Project." 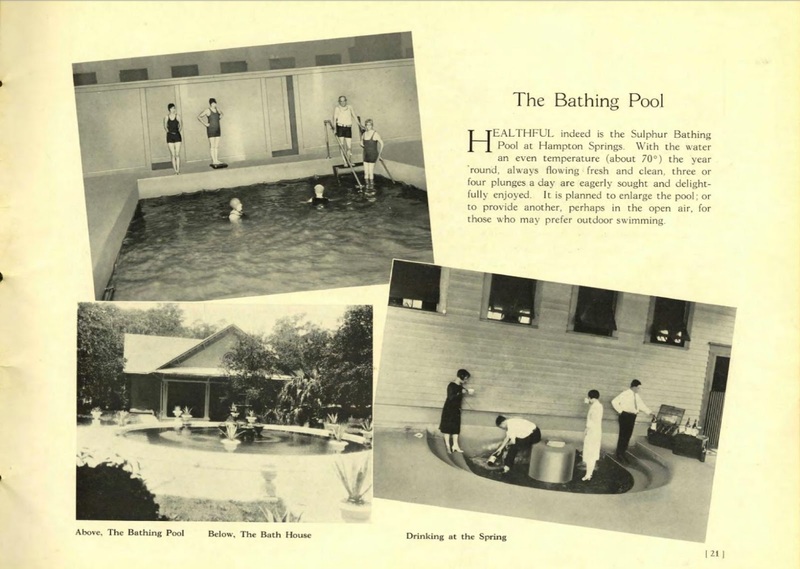 Learn and Serve America (LSA) was a program of the Corporation for National and Community Service. Created under the National and Community Service Act of 1990, LSA distributed grants in support of service-learning in order to simultaneously enrich the education of young people, demonstrate the value of youth as assets to their communities, and stimulate the use of service-learning as a strategy to meet unmet community needs. 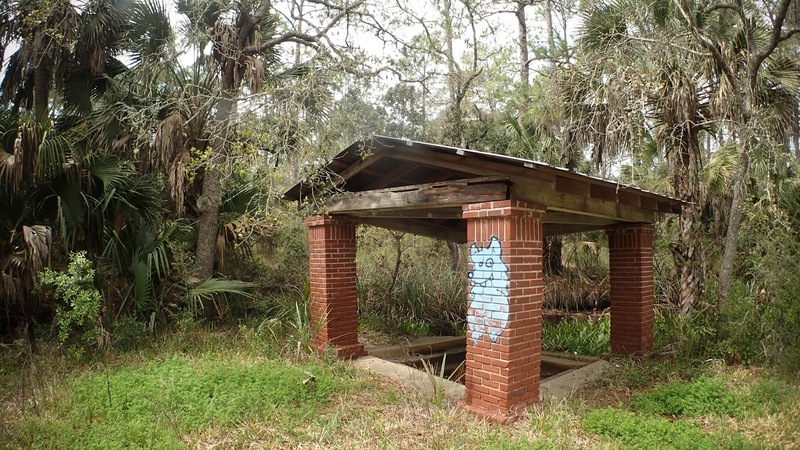 The federal appropriation for Fiscal Year 2011, signed on April 15, 2011, eliminated funding for the Learn & Serve America program which provided funds for the Florida Learn & Serve program. 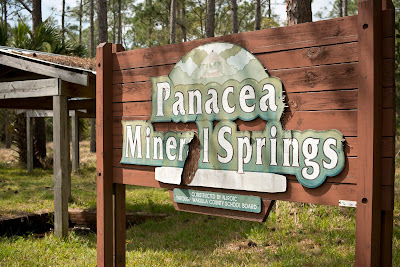 This sign is a remnant of that program. 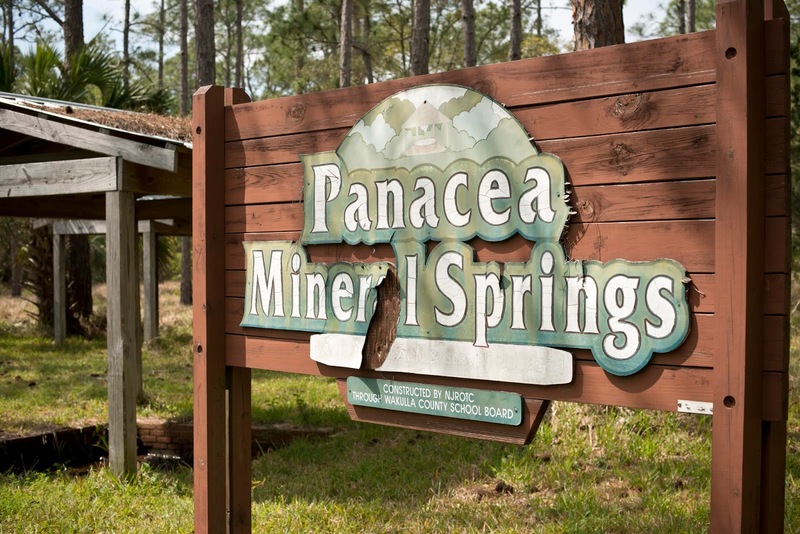 The final stop on our journey was Panacea Springs located in a roadside park just across from the Wakulla Welcome Center in the unincorporated town of Panacea. 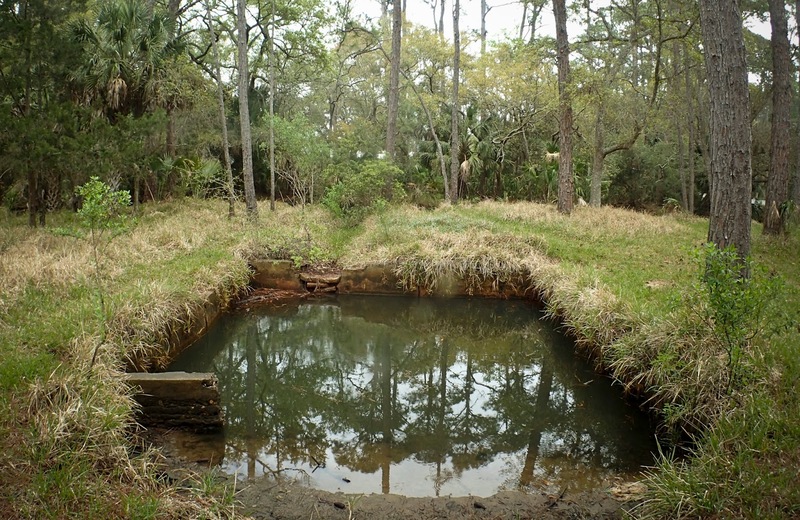 A large sign marks the spot where about half dozen small mineral springs still trickle into different size basins. According to Bulletin No. 31, the State of Florida's definitive report on springs, the site was home to a 125-guest hotel and some 20 medicinal springs in 1911. An ad from the Weekly Tallahasseean in 1901 boasts of new mineral and salt water pools, hot and cold water in all rooms, baths in the hotel, and "all modern conveniences" (including shuffleboard!) 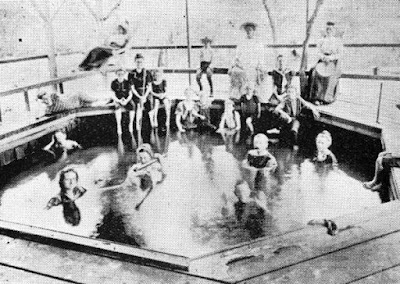 According to much more recent 2008 article, different springs were purported to cured different ailments and were labeled as such, including Arthritis Spring and Liver Spring. 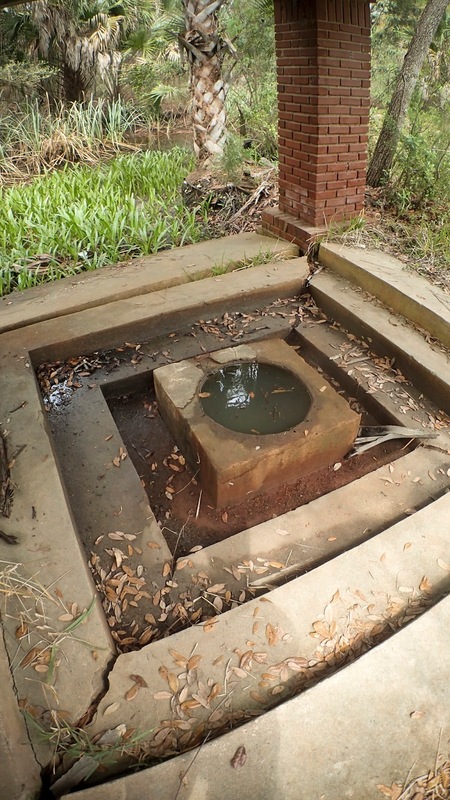 The spring closest to U.S. 98 had a brick wall around it leading to a circular opening, so I assumed it was the famed "Cypress Stump Spring" from which water flowed directly out of a stump. Nearby were several other rectangular basins of differing sizes, some sheltered, others completely open to the elements. One spring filled a pool large enough for several people, others were about the size of hot tubs. 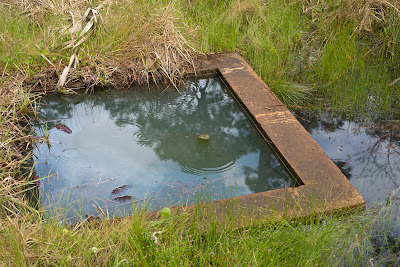 All of them had cloudy water that seemed to indicate a high concentration of minerals in the spring water. The most interesting spring was near the rear of the park, where three, (at one time four), brick columns supported a roof above a small, round basin, that reminded me of a spring one might find in a temple in the ancient world – a temple that was home to an oracle. Located right next to the creek, one of the columns had been pushed down into the water and another was decorated with graffiti. 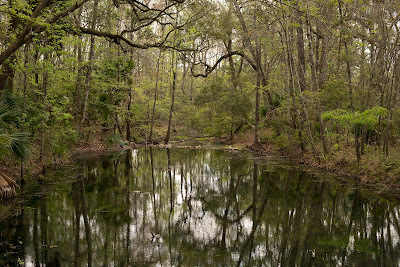 This place where the water was at one timed believed to have miraculous properties is very much at risk. Across the street at the Welcome Center I found some archival images of the spring, but no historical interpretation. 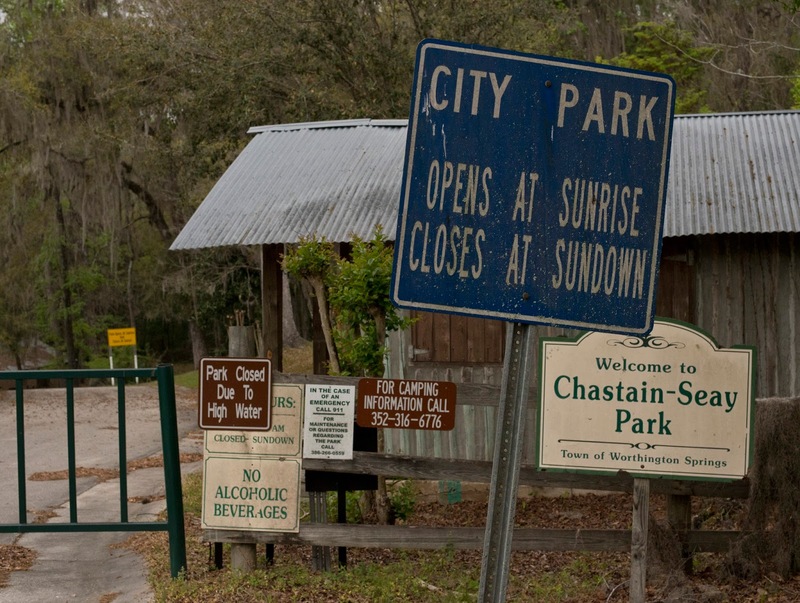 I emailed Wakulla County through their tourist website, and the county official who responded said that the park was located on private property and the county is not responsible for the park's upkeep. Yet the park is promoted as a destination for tourists and is mentioned on printed materials and included on websites. 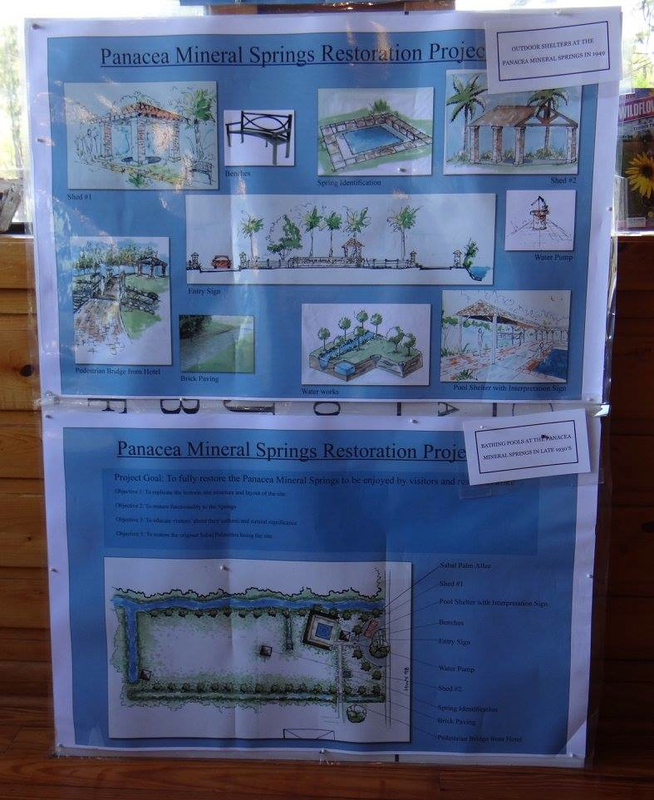 Additionally in 2015 the Welcome Center once posted renderings of restoration plans for the park. I have inquiries pending, and my hope is that these remnants of another era are somehow preserved. 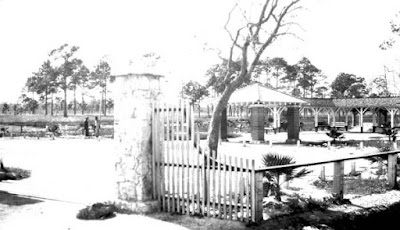 2015 photo from the Wakulla Welcome Center, courtesy Karen Chadwick. 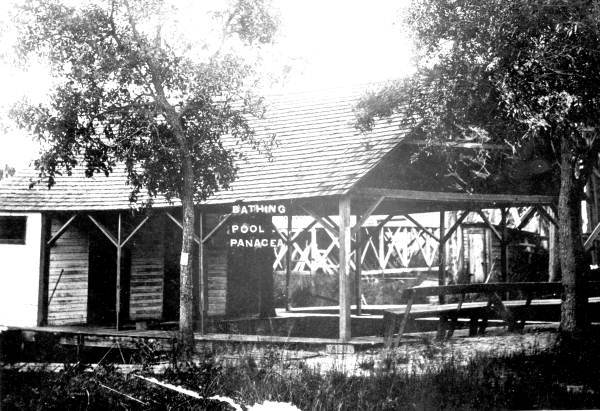 In summary, the spring pool at Worthington Springs is now covered by a parking lot. The spring pool at Hampton Springs was recently filled, and then emptied when residents reacted strongly to the loss of their swimming hole. 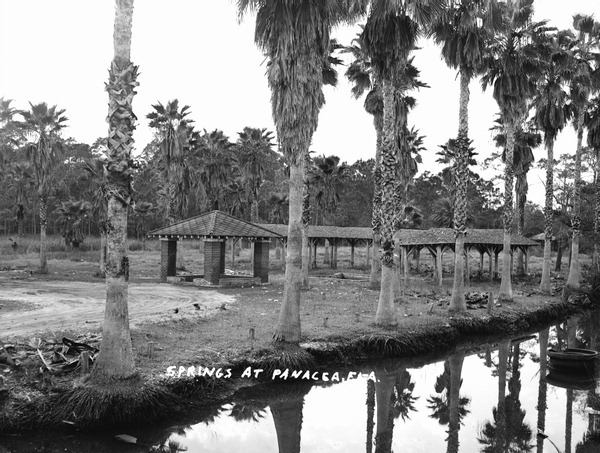 The basin at Newport Springs is fenced off, and the spring pools at Panacea are crumbling and at risk of falling by the wayside. I like the words of the mission statement of the Florida Division of Historical Resources: "To inspire a love of history through preservation and education" by cultivating "connections between people and place." 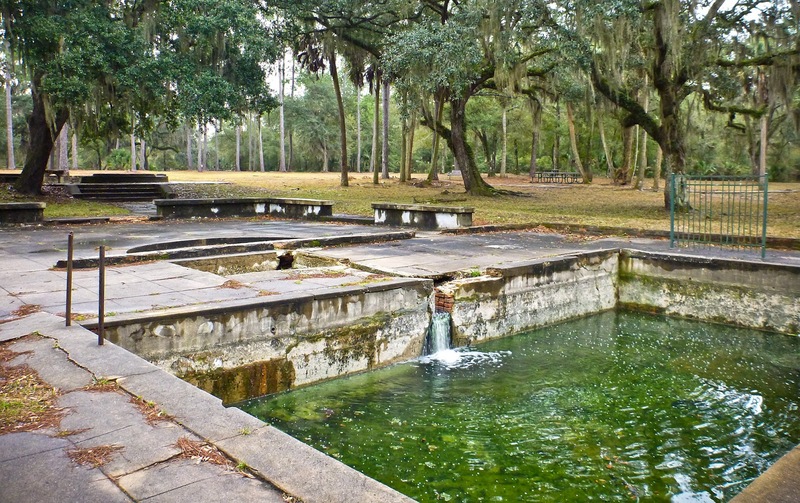 These spring pools are invaluable assets of our state's history where enormous opportunities exist to create connections between people and place. 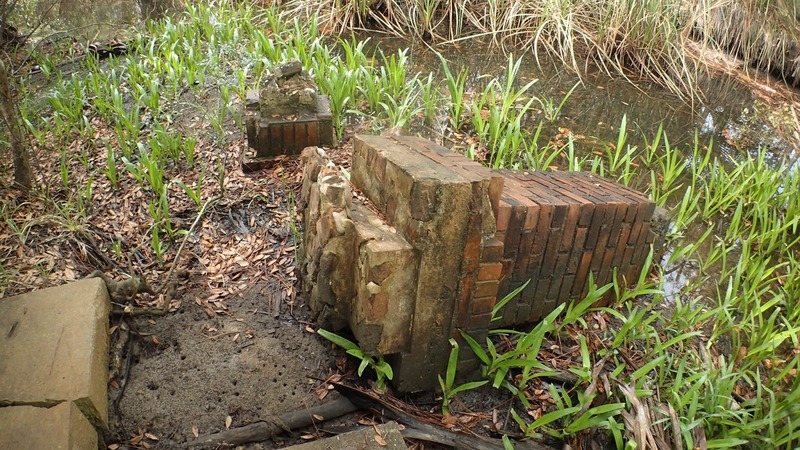 To let these assets crumble and disappear or in some cases, even be paved over, is unacceptable. One does not need an oracle to see the cloudy future facing these irreplaceable historic resources.